In 2007 I read Eliza Graham’s debut novel, Playing with the Moon and loved it. I fully intended to read more of her books, but although I have her fifth book, The One I Was, I somehow missed the other three! 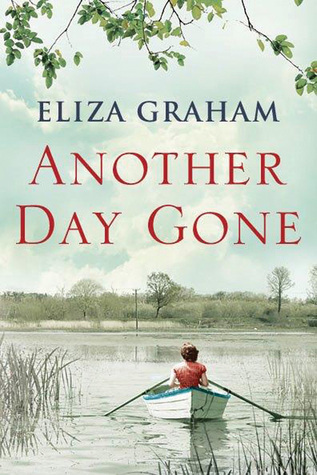 So when I saw her latest book, Another Day Gone was available I was delighted to receive an advance copy through NetGalley. I wasn’t disappointed – in fact I think it’s amongst the best books I’ve read this year. It’s historical fiction, one of my favourite genres, beginning in 1939 just before the outbreak of the Second World War when a bomb went off in Coventry, killing some people and injuring many others. One of those injured was a girl who had seen a man prop a bicycle outside a store just before the bomb exploded. Her description led to his conviction and execution. The action then moves forward to 1992 with Sara and her older sister Polly living in their family home in Oxfordshire on the banks of the Thames, with their grandfather and housekeeper (formerly their childhood nanny). The sisters’ parents had been killed in a car crash when they were very young. Polly is eighteen and is just about to leave home for university. All is not well and Polly hints that she knows a secret that she is not telling Sara – and then goes away with Michael, Bridie’s nephew, without saying where they are going or for how long. Years later, in 2005 Sara returns to her family home, taking refuge from the London 7/7 bombings. Polly has now been missing for 13 years, their grandfather has died and Bridie is in a care home. The family secrets are still buried – until Polly returns! Another Day Gone is a book about families, relationships and realising and living with the consequences of your actions. I loved the structure of this book with its different strands and time periods and all the twists and turns that kept me guessing about the nature of the secret that had remained hidden for so many years. I particularly liked the way it is only revealed drip by drip that meant I had changed my mind about what it was several times until fairly near the end of the book. The characters are so well drawn and sympathetically portrayed that I felt I knew them as people. It’s the type of book that I can get so involved with and whilst wanting to discover its secrets I just don’t want it to end. Hi praise indeed, Margaret. I’ve not heard of this author. I’ll be looking out for this one! This sounds like a really rich family story, Margaret. I like stories where we see, across the generations, the effect of something. And the characters sound interesting, too. I think I would love the structure of this book. I hadn’t heard of Eliza Graham (I don’t think . . .) but this is going on my TBR list. THanks for the recommendation! Thanks, I really must add this author to my list as I think I would enjoy her books. I love historical fiction myself and would love to try a book by this author. It’s wonderful to get your hands on a book that you don’t want to end. Thank you for the wonderful review.